Trinity in the Bible? : Three-Headed Trinity? (1) Abraham and the Trinity, (c.1270-80) inserted at the front of a fourteenth-century Psalter (English). It is claimed that this is a "Biblical" illustration, although the Bible itself never once presents the God of Abraham as being three persons. Indeed, the Bible only presents the God of Abraham as being one individual or person. -- Exodus 3:14,15; Deuteronomy 18:15-20; Acts 3:13-26. (2) The Three Headed Trinity, (c1260) Salisbury Cathedral. 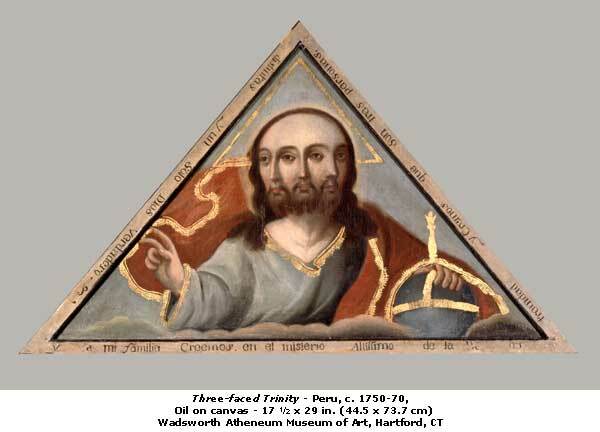 (4) Trinity_by_Jeronimo_Cosida (c1570) From Cistercian Monastery of Tulebras, Navarra, Spain. If anyone knows of more, please leave a comment below. 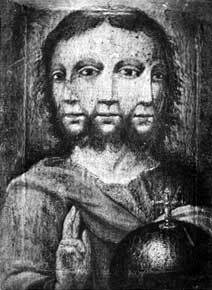 Evidently, there have been trinitarian artists who interpreted the idea of "three persons in the Godhead" to mean three persons, three heads, that make up the trinitarian idea of the Godhead.